Usk is a small market town of 2300 people in South East Wales. Its history goes back to the Romans and Normans. The Usk in Bloom committee was formed in 1981 by a group of enthusiasts. Since then the town has won many awards and attracted visitors to its wonderful display of flowers. All work is done by volunteers. Winner of the Wales in Bloom Large Village 2018. And it’s a Gold! 37th year in a row! Britain in Bloom 2018 Finalist Gold Medal. We won Britain in Bloom 2017. Usk was named joint winner of the large village category in the Royal Horticultural Society’s Britain in Bloom awards. Winners of class in “Wales in Bloom” 1982 to 2018. Won “Britain in Bloom” five times, finalists in another six years. Represented the United Kingdom in the European Entente Floral competition on three occasions. 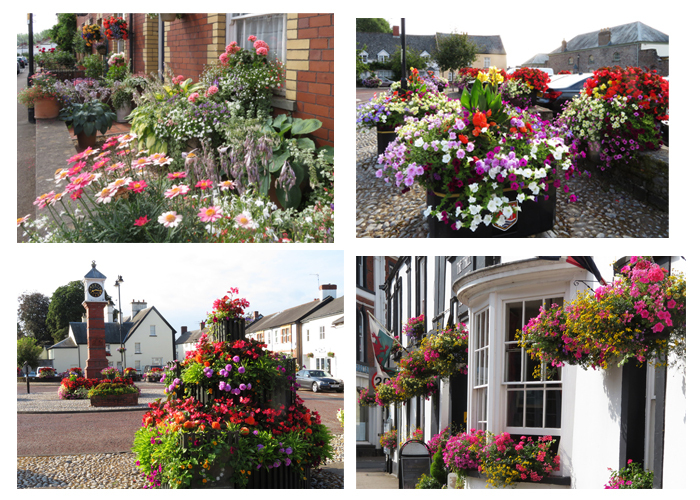 Improve Usk by the imaginative planting of trees, shrubs, bulbs and floral displays. Address environmental issues and preserve wildlife. Work with and educate the youngsters in Usk from nursery to junior age. Continuously plant and maintain the current flower beds and tubs around the town. Foster partnerships with other organisations in Usk to achieve these aims. On Saturday 29th & Sunday 30th June 2019 around 20 of the private gardens in Usk are open to visitors 10am-5pm, to raise money for local charities. The gardens range from small cottage gardens to the grand sweep of medieval Usk Castle. All are in walking distance of the free car parks and there is a regular mini-bus service around the town (10am – 4.45pm).